Bevel edged chisels fully forged from hardened and tempered carbon steel. 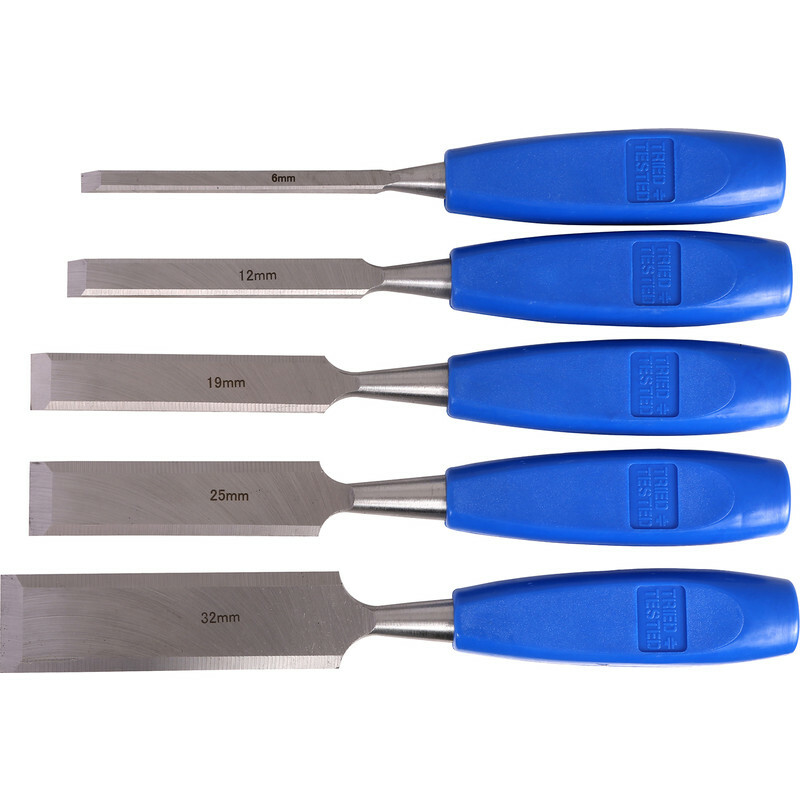 Split proof polypropylene handles can be struck with a hammer or mallet. Set contains 6, 13, 19, 25 and 32mm. Wood Chisel Set (5 Piece) is rated 4.0 out of 5 by 27. Rated 1 out of 5 by GregM from Blunt! Too blunt to use without sharpening, very inconvenient as only bought to fit one door. Rated 1 out of 5 by OldWomble from Great for wood butchers but no good for chippies So blunt you can’t even cut your finger with them Don’t waste your money. Rated 4 out of 5 by RichardM from Handy to have around. For a budget price, then this 5 piece set, fits the bill. And would certainly recommend them on that basis. Rated 2 out of 5 by dave1956 from get what you pay for not very sharp, buy cheap buy twice old saying should have bought a more expensive set. Rated 3 out of 5 by Phil K from Value for money Good value for the price but do not really have that cutting edge sharpness which you get on more expensive chisels. Rated 5 out of 5 by Sandpet56 from Great Bought these to do some home diy, very pleased with my purchase.